Some 60,000 of us, including shadow health secretary Jonathan Ashworth, took to the streets of London in the wet and cold on Saturday to demand increased funding for our beloved, yet beleaguered, NHS. Thousands more, including Jeremy Corbyn, marched in other cities or ran Labour NHS campaign sessions in their own constituencies. The NHS is in crisis, with an average of 91 cancelled urgent operations per acute trust since 1st December. “Urgent” means cancer, heart problems, aortic aneurysms – all seriously life threatening conditions. Tens of thousands of planned, less serious operations had already been cancelled this winter leaving many people, particularly the elderly, suffering in pain and housebound. The number of nurses has been dropping for the past 10 years and the cancellation of student nurse bursaries has caused a further 23 per cent drop in applicants for nursing degrees. This is placing an intolerable strain on the remaining staff, with many working 12-hour shifts without a break. It tests their sense of vocation but many struggle on, including a Labour member and senior A&E nurse, who despite undergoing chemotherapy for terminal oesophageal cancer is still at his post. Jeremy Hunt should be ashamed of the way he is pressurising staff with the stress of unnecessarily risky patient treatment, the overworking, plus the real terms 20 per cent pay cut that they have faced. 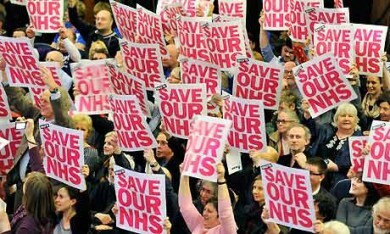 We want more money for the NHS now and we want an end to the flawed and self-defeating 2012 health and social care act. It has allowed the systematic compartmentalisation of health services, which often results in treating the patient in isolation from her other health conditions. The legislation also put in place “financially competitive tendering”. This led to the unscrupulous tactic of underbidding for contracts followed by demands for more money from private companies, the draining of so-called “profits” from the NHS to tax havens and even of Virgin suing Surrey because Virgin failed to win a contract. The newer threat of accountable care systems/organisations (ACOs) is likely to be imposed on us later this year, but sadly the public are still struggling to understand the impact of the 2012 act and few have even heard of ACOs. They have been presented by Conservative politicians and even NHS England as the panacea that will put joined up health and social care services under a single management in each of the new 44 health areas, thereby “solving all our problems”. However the reality is that this is exactly what the likes of Mr Branson has been lobbying for for many years: super-size contracts for large geographical areas that last for a minimum of ten years. The contracts, worth billions of pounds, will be paid on a basis of a set amount for each registered patient, not on what treatment they actually need. In summary, this is a shortcut to health and social care rationing and an opportunity for our taxes to become a healthy income stream for companies based in tax havens. Some of the old friends I met at the march on Saturday were from 999 Call for the NHS, the campaign group that walked with me on the Jarrow to Westminster NHS 300 mile march in 2014. They are currently launched a judicial review against NHS England over the legality of ACOs – a true David and Goliath fight in which they initially risked their own homes against the legal costs. Even if they don’t win, their battle will help the public to better understand the issues behind the jargon. The Tory destruction of our NHS was laid bare by our shadow health secretary Jon Ashworth on Saturday. He gave a rousing call to arms at the rally after marching alongside us: under a Labour government we will join up health and social care as part of a reinstated, publicly provided NHS, not the open season for privateers that is planned by the Tories. There will be no more PFI contracts and existing ones will be reviewed. The 2012 act will be scrapped and there will be no more privatisation of our NHS. We have the policies wanted by the public and it is down to us, in local grassroots Labour campaigns, to bust the jargon and spell out why the NHS is only safe with Labour. Fiona Dent was Labour’s PPC for Runnymede and Weybridge in 2017. Fiona Dent was a parliamentary candidate for Runnymede and Weybridge in 2017 and for Windsor in 2015.